Atlanta, Georgia, resident sees "more change now that it's the first black president"
ATLANTA, Georgia (CNN) -- Ann Nixon Cooper sits back in her dining room chair, her eyes closed tight and her lips clenched, when asked if she will attend Barack Obama's inauguration in January. Ann Nixon Cooper was born in 1902, a time when women and black people were denied the right to vote. "I could go and maybe would go, but I'm not looking forward to it," says the 106-year-old former socialite. What if Obama came to her house and asked her in person to attend? Cooper perks up and a big smile spreads across her face. "Oh, yes, of course I'm ready to go!" 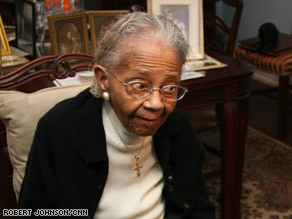 It's been a whirlwind ever since Obama mentioned the African-American centenarian in his victory speech Tuesday night. Throngs of media -- from the BBC to a Japanese station to national news outlets -- have descended on her Atlanta house. Strangers have stopped by too. She's taking it all in stride. She stayed up later than usual, until about 3 a.m., after Obama's speech and the phone began ringing off the hook. She had been tipped off by the Obama campaign that he'd say something. Cooper -- who was born during a time when women and black people couldn't vote -- fully understands the significance of Obama's victory. "Things are changing, changing, changing, and I look for more change now that it's the first black president in victory of faith over fear," she says. "Don't you know, that's quite something to be proud of." What would she tell Obama if she ever meets him? "I wouldn't have anything special to say about Obama. I enjoyed listening to him, but that's all," she says. "I would be proud to meet him as anyone else." She and her late husband, prominent dentist Dr. Albert Cooper, raised four children in her house. The home was a center of Atlanta's black society and the scene of many parties. She knew Martin Luther King Jr. when he was just a boy and was close with his mother. She sometimes refers to Obama as "that young man." "This election had many firsts and many stories that will be told for generations," Obama told the tens of thousands of supporters who had gathered in Chicago on Tuesday night. "But one that's on my mind tonight is about a woman who cast her ballot in Atlanta. She's a lot like the millions of others who stood in line to make their voice heard in this election except for one thing -- Ann Nixon Cooper is 106 years old. "And tonight, I think about all that she's seen throughout her century in America -- the heartache and the hope; the struggle and the progress; the times we were told that we can't, and the people who pressed on with that American creed: Yes we can." She added that her late husband "would be elated" a black man will be president. "Yeah, he'd be so tickled to death," she said. "We looked forward to changes. Everybody looked forward to a better life." One of her grandsons, Albert B. Cooper, said the family has been overwhelmed with pride since Tuesday. "It was a bigger honor than you could ever imagine to be mentioned in Obama's speech. For her to be used as an example of the strength -- and all the changes that have gone on within the black community -- is stunning. We were touched and proud and I can't come up with the words," he says. "It's an amazing thing." Ann Cooper has called Atlanta home since the 1920s. She co-founded a Girls Club for African-American youth and taught community residents to read in a tutoring program at Ebenezer Baptist Church, where King preached. Celebrities, including the late singer Nat King Cole, often dropped in to visit. One time many years ago, a young student from Morehouse College stopped to visit. He spoke of dreams to become a filmmaker. That man, it turns out, was Spike Lee. "It's been a house with a heap of living going on in it," Cooper said. Born in 1902 in Shelbyville, Tennessee, Cooper danced the electric slide up until the age of 103. She has recently slowed down after suffering several heart attacks and a fractured hip. On a typical day, Cooper spends hours watching television in her wood-paneled sitting room. Her favorite shows are "The Price is Right," "Oprah" and "Dancing with the Stars." Three of Cooper's four children have died; her surviving daughter is 83. She has 14 grandchildren living and many great-grandchildren and great-great-grandchildren. When CNN first interviewed her in October, she said she only had one thing left to see in this world. "I ain't got time to die 'cause I've got to see a black president," she said, giggling with excitement. "I've got to see that." Now, she says, "I would be very proud if I could just meet and shake his hand."